The band is derived from Denmark and 4/5 of the musicians performed on King Diamond‘s album from 1990, “The Eye” , the guitarists Andy La Rocque and Pete Blakk, bassist Hal Patino and drummer Snowy Shaw are featured on “Free Falling Angels” and it also include guitarist Sebastain Sly. 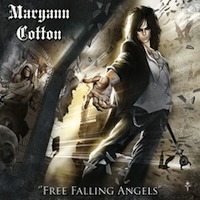 This is the debut album from Patino‘s son, Danish rock singer Maryann Cotton (born Jackie Patino). It sounds very melodic and the influences from the 70's and 80's rock are obvious. Old school rock 'n' roll with a singer, who is trying to sound like a young Alice Cooper vocally. The best track is the title song with some cool, smooth guitar riffs and funky rhythm sections and some parts in the gentle ballad 'Night Train To Paris', but the rest of the songs on this album are if I must be honest: well below the acceptable low-water mark. No energy, no stiff riffs and no power. I find no reason why you should buy this mediocre album. Use your money on other releases coming out this summer. The story behind the name of the band is more interesting. Britain's first serial killer Mary Ann Cotton's fate and history is a ghoulish reading.